JNN 27 April 2014 KARACHI: Police investigators have found that the Friday bombing in the Clifton area `missed the target` by only `10 seconds` as CCTV footage showed the bus carrying people belonging to the Shia community had just passed through the area when the explosives-laden rickshaw was detonated, it emerged on Saturday. The investigators associated with the Crime Investigation Department (CID) and the Special Investigation Unit (SIU) of police and intelligence agencies visited the blast site many times on Chaudhary Khaliquz-Zaman Road in Clifton`s block 8 a day following the tragedy. Apart from recording statements of area people and those who rushed to the blast site after the huge explosion shook the district south, the investigators also succeeded in obtaining the footage of the incident recorded by one of the cameras installed at a nearby residential building for security purposes. `The CCTV footage show that the rickshaw was detonated exactly 10 seconds after the bus carrying the people who had offered prayers at Imambargah Yasrab in DHA Phase IV passed through the bombing site, said an investigator pursuing the case. `Fortunately the miscalculation of the time and the distance between the bus and the rickshaw saved us from an even bigger tragedy. The official said the rickshaw `most probably` containing locally-made 10-kilo bomb was parked on the other side of the road with part of it dug up. The three-wheeler was `deliberately` parked on the dug up site expecting the bus to slow down on this patch of the road, he added. `But the bus driver fortunately crossed that patch at the usual speed that probably was not expected by the people who had planned the attack and they missed the target by seconds. Secondly the bus passed by the explosives-laden rickshaw not closely but at some distance,` the investigator noted. At least six people, including a woman and her son, were killed and 28 injured in the bomb blast in Clifton on Friday just a day after a police officer , Mr. Shafiq Tanoli ,and three other people had been killed in a suicide attack near the old Sabzi Mandi (vegetable market).Who was even earlier targeted in a Suicide attack by the Taliban , and was even claimed by the Taliban , as he was a Prime target of the Taliban , due to his activities against them. Speculation about the target of the Friday bombing came to an end when Sindh IG Iqbal Mahmood told the media that it was actually the bus carrying the Shia community members who were returning from Imambargah Yasrab in Defence Phase IV after offering Friday prayers. Unlike the past when banned outfits claimed responsibility for such attacks, there was no word from any terrorist group following the blast. But police investigators considering past attacks and current ñndings indicating a sectarian motive for the attack believed it was the job of a terrorist Organisation. `The modus operandi suggested that the banned Lashkar-i-Jhangvi might be involved as it has expertise in such IED [improvised explosive devices] blasts,` said Raja Umer Khatta, who heads the counter-terrorism unit of the CID, while confirming that CCTV cameras recorded the incident. 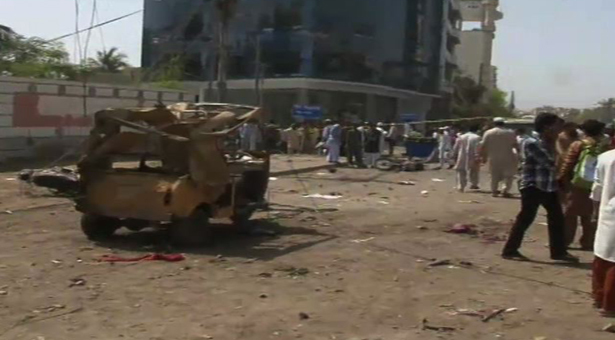 `It`s now confirmed that a 10-kilo locally made bomb was planted in the rickshaw. There was nothing new in that particular case including the explosive which was used and the way bombing was carried out. Meanwhile, the Frere police registered an FIR (106/2014) on behalf of the state under Sections 302 (premeditated murder), 324 (attempted murder) of the Pakistan Penal Code (PPC), 3/4 of the Explosive Act and Section 7 of the Anti-terrorism Act againstunidentified suspects. The district south police also carried out a `search operation` in the early hours of the day in the neighbouring Delhi Colony and Gizri areas and picked up more than 30 `suspects`. The officials couldnot explain the motive for the late-night raids on houses in the areas where people complained that the law-enforcement agencies detained mostly labourers without disclosing details. `Most of them were released after a fewhours of questioning,` said a senior officer wishing not to be named. `They were picked up to seek details which the police wanted to know. There are also reports that some miscreants` presence in the area led to the raids,` he added. This entry was posted in Asia Pacific, Pakistan News and tagged bomb blast in karachi, CCTV footage, Police investigators, shia community, Shia News, Target Shia Namazi. Bookmark the permalink.